If you haven't picked up your free August Block of the Month yet be sure to click on the BOM tab and download it. This is the center block in the 3-block panel that forms the first row of the design. It is also repeated in the last row. If you want the bonus block, subscribe to my newsletter and you will get links to both block delivered to your email box. Please note: signing up for my newsletter is a 2 step process. 2) open your email and click on the link to confirm your email subscription. If you don't confirm the subscription it won't send you a newsletter. This way I make sure your email is valid and you confirm that the newsletter is approved email and not spam. Of course you can unsub anytime right from the newsletter, if you no longer wish to receive it. I gotta tell you I really fell in love with this bonus block and have designed a small quilt project using it and next month's bonus block. 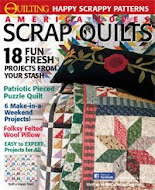 You can get it for free if you are a member of Becky Jorgenson's Patchwork Posse quilting site. 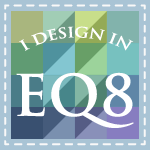 Also next month I am participating in an EQ Seasons Row-A-Long Blog Hop and you are NOT gonna want to miss this. My row (and the free pattern for it) will be featured on September 15. 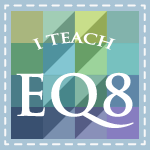 Sign up for the EQ Seasons Row-A-Long on Facebook. The other rows are even cuter than mine and they each represent one of the seasons. Mine is summer, of course and camping season. Wait till you see some of the quilts the girls are putting together with the rows. OMG I am soooo wanting to do one. So check out my blog in September for this cool event. I will be offering great fabric pack and pattern giveaways all month long! Oh, and I saved the best news for last. Grandbaby #2 is on the way! Is the Aug 8th email supposed to have the link to the block and bonus block? I can't find an earlier email in my inbox. Congratulations on grand baby #2! I really like you wiley raccoon! This is such a cute row!